Let me take you back a few years. It’s April 2010 – and Steven Moffat, it seems, has worked a miracle. The Eleventh Doctor has sprung fully formed from the ashes of his weary predecessor, last seen bending over a TARDIS console and regenerating simply to shut up the Ood (hashtag #Dontyouthinkhelookstired). 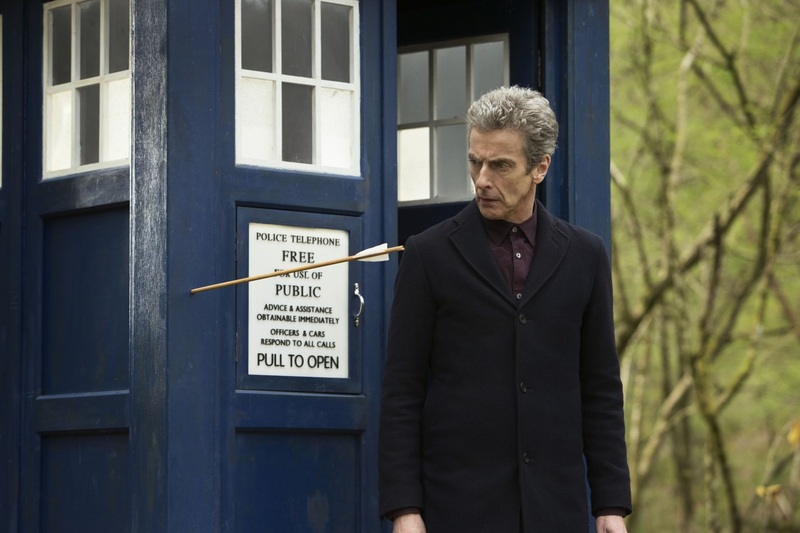 The new Doctor is sprightly and sophisticated, and fun, in the best possible sense of the word. So, too, are the scripts, moving along at a rollicking pace, clever and amusing and…well, more grown up, somehow, being oddly respectful towards the show’s audience and working on the assumption that Doctor Who can be a little more complicated, and that the audience in turn will hold sufficient intelligence to be able to keep up. Then along comes Victory of the Daleks, and there are Spitfires on the dark side of the moon. The bloody moon! As if this hadn’t already stretched the bounds of credibility to breaking point, there’s a far more serious problem: the fact that said Spitfires go from blueprint to space in approximately fifteen minutes, which is barely enough time to get from Paddington to King’s Cross in central London, let alone from the War Room to the exosphere. We know the window is ludicrously small because it’s there in the script, although it occurs right around the time the Doctor spends five minutes holding the Daleks hostage with a Jammie Dodger without crumbling it, so I suppose that sort of thing is easy to miss. While many would protest that it’s churlish to complain about scientific implausibility when your central dramatic conceit involves a thousand-year-old time traveller roaming the universe in a disguised police box, this really is too much, and the fans are quick to voice their dissent. For the first time this year, the knives are well and truly out, and most of them are pointed in the direction of Mark Gatiss. I’m not going to pretend I’m a fan of any of these stories. Even An Adventure in Space and Time, the 2013 docudrama telling the tale of the show’s creation, seemed only anomalously good, the sort of begrudging acceptance we give to things we didn’t think we’d like because they’re written by writers we don’t. Still. 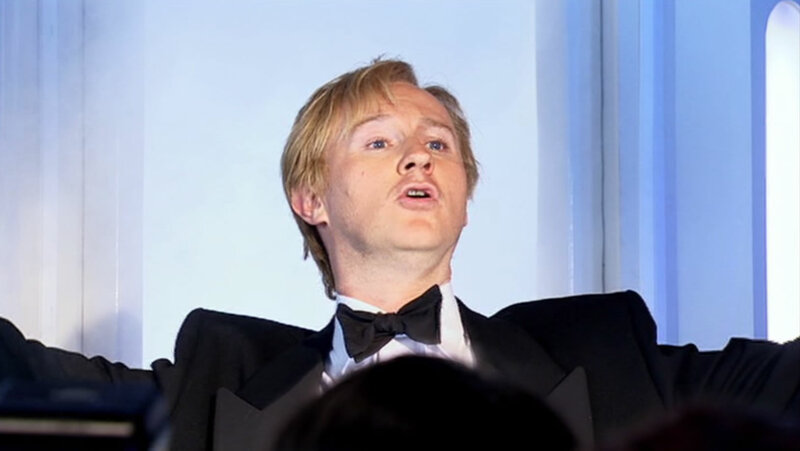 There was a point at which I began to actually see what Gatiss was doing. It was the day of The Crimson Horror – that anachronistic, deliciously silly tale of industrial intrigue, in which the Doctor is a supporting character in his own story, Diana Rigg acts her daughter off the screen and we get to see Strax actually behaving like a Sontaran instead of an undersized comedy butler. That the episode succeeds to the extent that it does is down to visualisation and direction as much as anything else (the grainy, whitewashed flashback scenes, echoing classic TV drama, are simply delightful). But Gatiss gets the lion’s share. He tells a ridiculous story with a knowing wink at the audience. He puts in a joke about sat nav, for god’s sake. It is Doctor Who that we are clearly not to take seriously – from Strax’s irritation that he has to eat another horse to Brendan Patricks’ turn as a man whose sole job is to faint, everything here is gratuitously over the top, and glorious fun as a result. Perhaps that’s just me. But I wonder if fun is something that’s lacking a little bit these days. With every year that passes, Doctor Who feels more and more like a show cocooned in its own self-importance. It’s the price you pay for being a high profile export (well, that and Downton Abbey, which is similarly dreary). There is a sense of not messing with it, of doing it right, of being groundbreaking and telling important stories. And there is a place for important stories. No one would argue against the jaw-dropping game-changer that was Heaven Sent, or the political discourse of Peter Harness’ Zygon narrative. Simultaneously, I think you can overdo it. 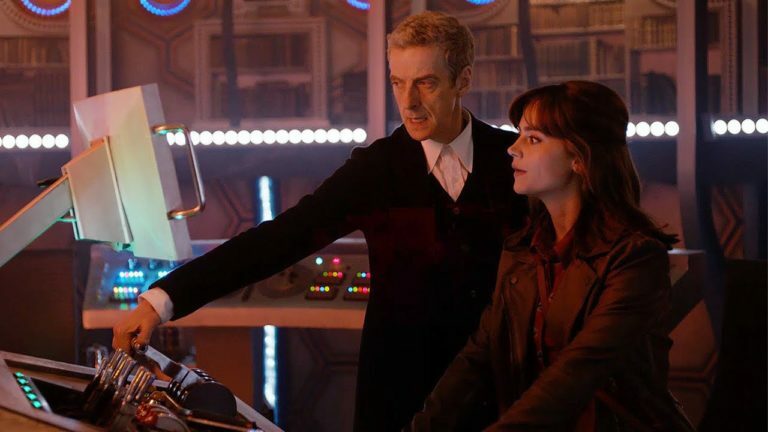 There’s a much-repeated trailer for Series 8 featuring the Doctor and Clara standing next to the TARDIS console: when Clara asks where they’re going, the Doctor replies “Into darkness”. 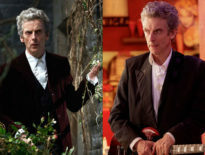 It’s a theme that pervades throughout Capaldi’s run: an antidote, perhaps, to the boyish adventuring that characterised much of Smith’s turn at the helm, at least until his last series. It starts at Deep Breath and it’s still going even as the TARDIS flies away at the end of Series 9. Moral ambiguities are endemic and empathy all but absent. The Doctor may or may not have pushed that clockwork robot off the tower. 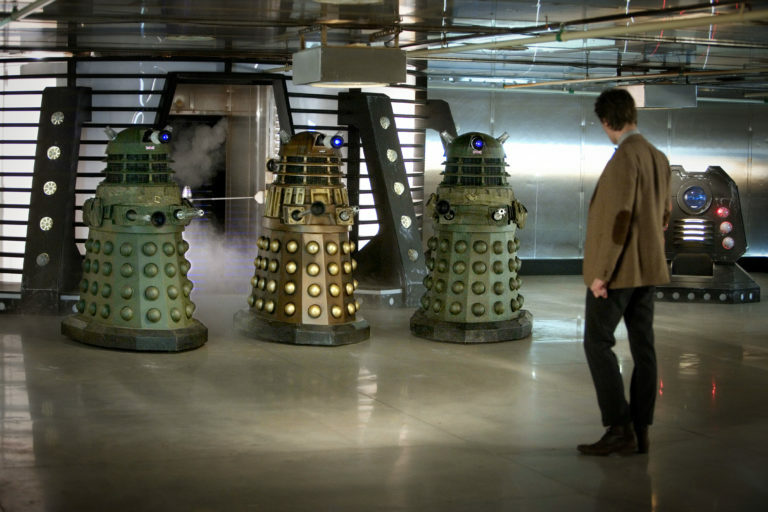 The Dalek’s reborn hatred is fuelled by its greatest enemy. Secondary characters are manipulated, abandoned, and discarded with a sense of apathy that is eerily reminiscent of early Colin Baker. It is acceptable to not actually like this Doctor very much: tough, brilliant, uncompromising, and unapproachable, like a deputy headmaster at a private school. The blackboards are not a coincidence. 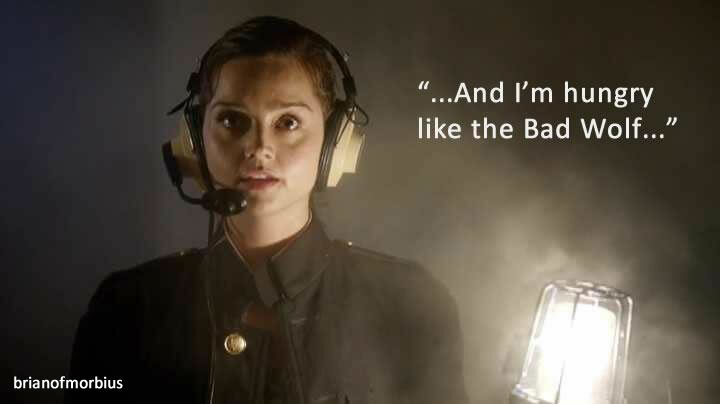 JENNA: Oh, you are s**tting me. 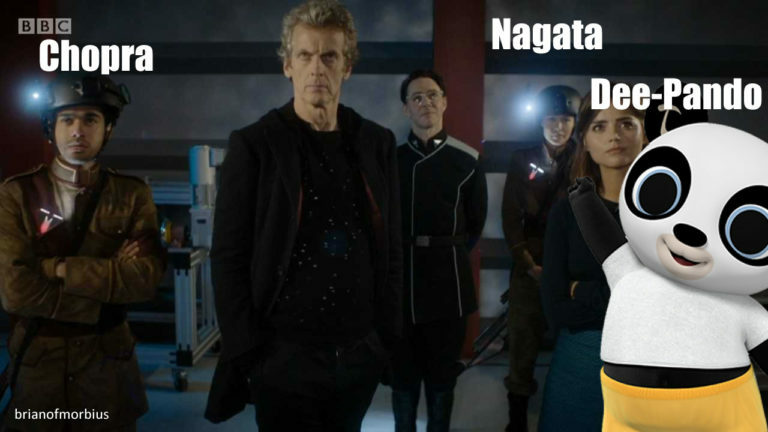 PETER: Yeah, that’s – I’m pretty sure that’s not in the script, Jenna. JENNA: I mean, he’s written, whatever, he’s written a monster that’s made out of sleep dust. MARK: It’s never been done before, though. JENNA: No, because it’s a f**king stupid idea! It defies common sense and logic! It’s the worst kind of pseudoscience! This is supposed to be new levels of realism and my suspension of disbelief just had its strings cut. STEVEN: Don’t hold back, Jenna; tell us what’s really bothering you. JENNA: Shut up. Look, it’s as bad as that episode of Red Dwarf where Chris Barrie was gonna clone himself out of dandruff. And that was supposed to be funny. PETER: Yeah, that one was funny, actually. JENNA: Was. I don’t know. Yeah. MARK: Look, it’s – they’re gonna look horrible. In my head, I mean, they’re like big brown things. Big wrinkled brown things with enormous mouths. STEVEN [to the room]: Don’t spread that around, everyone, it’s not on the list of controlled leaks. JENNA: Made of sleep crust. JENNA: Probably a good thing this guy wasn’t trying to cure the common cold. But there’s a pattern here. It’s a stupid idea, and Gatiss must have known it. To deny him that luxury is insulting. This is the man who weaves all manner of complicated threads when he writes those long monologues for Benedict Cumberbatch. This is not the mark of a man who doesn’t know what he’s doing; it’s the mark of a man who simply doesn’t care. Bob Dylan once asked ‘How many times must a man turn his head / Pretending he just doesn’t see?’, and we might, in turn, ask ‘How many stupid ideas can we watch / Before we accept that they’re deliberately stupid?’. Steven Moffat tells his writers to stay off social media, purely for their own sake. It’s a warning Gatiss has gleefully ignored – “I was delighted,” he remarked on Twitter, the morning after the episode aired, “to go on the internet today and get told by thousands of people that I’m the one who saved / destroyed / reinvigorated / condemned Doctor Who”. I’m paraphrasing, but you get the idea. Perhaps it’s a chronic misreading but Gatiss gives the impression, above all else, of someone who’s having fun – not in a malicious sense (we’ve come a long way from that notorious ‘Any old f**ker with an equity card’ sketch) but simply in the sense of making entertaining, wildly implausible TV. His episodes are ridiculous because he likes them that way. Doctor Who is, or should be, a fun thing to write, and Gatiss’ game plan is, above all else, to have fun. Of course he’s not taking it too seriously; he’s got Sherlock for that. And I can’t help wondering whether he’s on to something. I wonder if our tendency to take Doctor Who more seriously – to critically appraise and condemn, amid the insistence that we, as fans, know best – is part of the breeding ground for this rampant toxicity I see online. There’s a time and a place for bringing down sycophancy, but I wonder if in the process of doing so we’re using a sledgehammer to crack a nut. I wonder if these days we treat this lumpy, battered old show with more reverence than it deserves. I wonder how many collective sighs of relief were uttered across the Twittersphere when it was announced that the Chief Writer’s baton was to be passed one way and not the other, and whether this was actually deserved. And I wonder if we rage against Gatiss and his ilk not because his episodes are bad – although some of them undoubtedly are – but ultimately because they’re not the direction we’d like to see the show taking. What price might we pay for this, further down the line, when the programme has become so insular that it dies a quiet, ignoble death, condemned by its own fan base? How might we be liberated if we were to follow Gatiss’ example and simply have fun, however preposterous the result? And how might we be rewarded if we responded more positively to the ludicrous and the implausible, if the result is good entertainment? Oh, we’d have to stop putting Doctor Who on a pedestal. We’d have to acknowledge it as silly, superficial family drama – but if that’s what it takes to keep it fresh, isn’t that a price worth paying? Just no more Spitfires, please. They really were s**t.